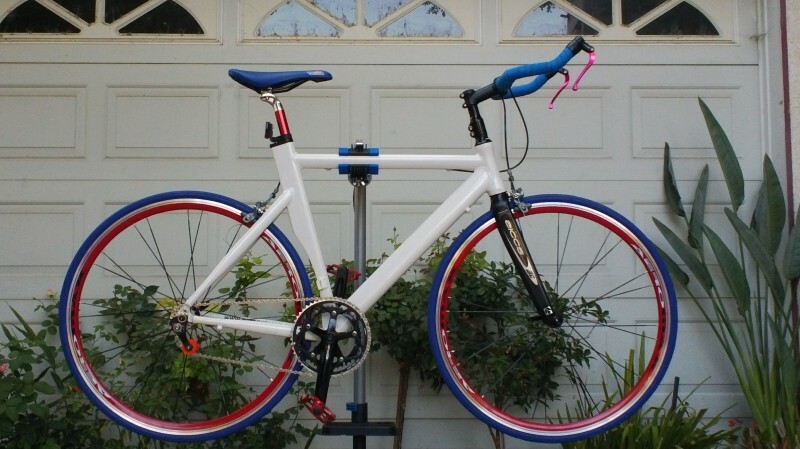 2013 Custom Build Aero Frame Road Bike Single Speed Conversion! A all new Bike build! 7005 aero aluminum frame w/ ZICCS carbon fork & FSA headset. Alloy blue bar wrap bull horn with red anodized lft & rght bar end brake levers. Red Vuelta Aero Max wheelset w/ blue Duro tires & a rear single speed converter. Shimano 3500 series brake calipers. Blue Velo gel tech end zone seat with anodized red aluminum alloy seat post. FSA dual chain ring crankset with RPM square tapered, sealed bearing bottom bracket. This bike is amazing in look & build quality. It can be converted back to a 16/18/20 speed bike by placing a 8/9 0r 10 speed cassette with correct front & rear deraileurs & correct shifters.